Our computers are dying. The Macbook is 7 years old and is starting to show its age. The Windows laptop I bought for Mrs. 1500 was junk, lasting only a couple years before the display crapped out. Grrrr. I decided to buy a new computer, but didn’t know what to get. I love Apple products for their very high quality and durability, but they also come with a steep price tag. This new computer was going to be primarily for Mrs. 1500. One thing I’ve noticed is that the Mrs. does almost all of her work in the web browser. After thinking on it for a while, I decided on a Google Chromebook. We picked up the Chromebook from Costco a couple weeks ago and love it. If you’re not a geek like me, you’re probably wondering what on earth I’m talking about. Please allow me to tell you about our new computer and why it may be perfect for you. What the heck is a Chromebook? 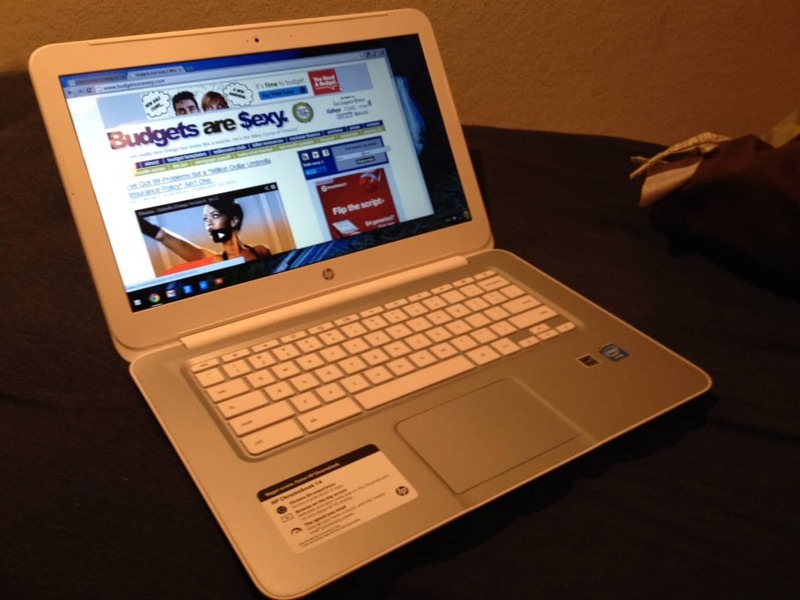 A Chromebook is an inexpensive laptop computer that runs Google’s Chrome web browser. That’s it. No Windows. No Linux*. No Apple OS. Why would I want a computer that only consists of a web browser? Think about the amount of time you spend on a computer and what you’re doing on it. Most time is spent in a browser. Email, facebook, Google Docs, etc. It’s becoming a web world. How much do they cost? I bought a high-end one at Costco last weekend for $379. Most of them seem to be in the mid 200’s though. How is the quality of the hardware? My HP version is Apple-esque. Very good. I think my Macbook is a little better, but not by much. The Chromebook is a lot nicer than the Dell notebook that I have to use for work. One great think is that it’s solid state; no moving parts. This alone makes it a lot more durable than most laptops: no hard drive to break. Other person: I need a computer, what do you recommend? Me: You should get a Chromebook! Other person: Does it run Microsoft Office? Me: No, but it does run Google Docs. Google Docs is similar to Office and is even compatible with Word. Best thing of all is that it saves all of your files to the cloud. No more losing stuff when Word or Windows crashes. Docs doesn’t have all of the fancy features of Office, but how many of those do you use? Besides, Office alone costs 100’s of dollars. Other person: But I want Microsoft Office. I don’t have a clue why people are so obsessed with Office, but trust me, there is life without it. What about storage? This is one of the best parts. The Chromebook uses Google Drive (cloud storage). The Chromebook has it’s own storage too, but you probably won’t use it. Chrome Extensions: Extensions are add-ons to the browser. Want to run Spotify? There is an extension for that. Here’s one for TweetDeck. Angry Birds anyone? Web Apps: HTML (the language of the web) is now very powerful. There are some great interactive websites that can replace the software you use on your computer. We use PIXLR for photo editing. I use Google Huddle for video calls. Does anyone not use Gmail these days? What about offline work? This is a valid concern, but the Chromebook has your back here too. Read about all you can do offline. What about Skype? This may be the biggest drawback, no Skype support yet. However, the Chromebook supports Google Huddle which accomplishes the same thing. Who wouldn’t you recommend a Chromebook too? A Chromebook is no good if you spend a lot of time out of your browser. Off the top of my head, it won’t be good for gamers, software developers and people who use other software packages. Anyway, if you’re in the market for a new computer, check out the Chromebook. If you already have one, let me know what you think. *If you want to get all technical and geeky, the heart of the Chromebook is the Linux kernel. I have a chromebook and love it! The battery lasts 7-9 hours, and it weighs less than a macbook air, in addition to all of the features you pointed out. My basic one was $249, and I love it so I can only imagine how happy you are with the $379 version! Exactly, you nailed it. I’m glad to hear that even the cheaper ones work well. This is timely. I need a new laptop and haven’t been able to decide what to get. I’ll look into it. Haha, funny isn’t it. People ask your advice and don’t take it. Reminds me of Marvin’s blog post this morning. I’ll be giving Chromebook a good look next time we get a computer. I’ve been running Open Office for years and like it far more than Microsoft Office. I certainly wouldn’t pay to go back. I don’t have much experience with Google Docs, but I’m sure it’s great……what Google product isn’t?! Google is killing everything in its path. They are changing the world. I’ll have to check out the Chrome when I need a new one. I was thinking the same thing…does it run Microsoft Office? I know I know…it’s just that I’m so used to it, but I’m up for trying google docs instead since it’s compatible. It’s definitely a good option at that price point. Andrew@LivingRichCheaply recently posted…Are You (Financially) Better Off Than Your Parents? If you’re a serious Excel junkie/power user, Google docs isn’t going to cut it most likely. The formatting is gd-awful and it’s so slow and clunky to use it’s incredibly frustrating. But then again Numbers is pretty freaking terrible for power users as well and Apple computers cost an arm and a leg. Sigh, agreed. This is something I’ve wondered about too. Google has a bunch of math geniuses working there. Get it done! Microsoft doors have the Office 365 web based site that they are getting ready to rename and update again. Power users still won’t find everything they need, but if you’re just more comfortable in the world of Office, it could be a viable alternative too. They are definitely an interesting proposition for a lot of people, but i use way too many other non web supported software packages to make the switch at this point. For a lot of people who are net content consumers or do minor creation/editing on documents it could definitely make a lot of sense (above even say a tablet). I ended up getting a bargain on a little netbook, but Chromebook was my primary choice when I was looking for a laptop for my freelance writing. They really are nice machines for the price. The netbook is a bit small, so I may still end up buying a Chromebook at some point. My dad has been ordering Chromebooks for work instead of traditional laptops–employees only needed internet access, so he’s saving a ton of money that way and it’s not a huge deal if they break. Good to hear a Chromebook success story from your father! Mine amazes me a little more each day. I hope it holds up for the long term though. Apple is very good in that respect. I was thinking of getting one to replace my older laptop. I mainly want to use it for blogging purposes. I’d like to be able to write somewhere other than my desk! I was looking through reviews on Amazon to get an idea of how powerful it is, because I’m often running with 6-8 tabs open in Chrome, and I wasn’t sure if it would be able to handle that. I like to multi-task a bit too much. Glad to hear it’s a hit! E.M. recently posted…What Are Your Distractions? I’m a tab fanatic! I’m typing this on my Chromebook now and glanced up to see that I have 16 tabs open with NO performance hit at all. This thing is really great. We are a Lenovo household, but I’m open to the Chromebook, especially as a ‘2nd’ computer. When our next Thinkpad wears out (we run them into the ground…I’m thinking about a 7-10 year lifespan, based on my wife’s last T42) a Chromebook might be the best choice. As long as I remembered to save some docs onto the local memory before getting on a plane or going somewhere without wifi, it probably would be fairly seamless. Thanks for the in-depth review. Lenovo makes some fine hardware. I like them too. You’d be surprised how much the Chromebook does for you. This one came with 2 years of free 3G connectivity. If its not on wifi, it automatically connects to 3G. I swear, I love this thing more every minute. We actually bought a HP 14″ chromebook this past Saturday. We love it so far since everything we do is on the web. Plus it boots up in 4 seconds or so! Crazy! I see Costco sells the 4gb memory 32gb storage for $379. We got the 2gb memory and 16gb storage for $299 from BestBuy. I love the boot time too! This thing is seriously great. Google is taking over the world. I’m with you on chromebooks. If I could do it over again, I would have bought one. About a year and a half ago I bought pretty much the same thing in a light, $300 PC. There’s just no reason to spend $1,000 on a Mac if all you are doing is checking email. I’m pretty much a google man through and through despite having an iPad – most of the apps I use on a day to day basis on that are google ones anyway though… hah. The only other one that is extremely useful for keeping blog posts and ideas synced across devices is Evernote, but it has a webApp and Chrome webApp anyway. So next time I think this will be a good replacement for my iPad, which due to the built in death clock of around 3 years on those things, should be due for replacement pretty soon! I do like the iPad but it is just too expensive to justify getting another one. Lol that would probably be with the Microsoft Office dialogue, especially when it comes to Excel. Google Docs is pretty great for my personal use, though, so thanks for the review! This is good for personal use if you use the computer minimally, but there is no life without Office for me even personally. Google Docs simply doesn’t cut it particularly for MS Excel. It’s clunky and gross but MS Excel is far more robust than Google Docs. Ha, you win this round. I’m not a big Excel user myself, but others have brought it up, so clearly Excel is important and worthy. As for your busted-display windows laptop, have you considered replacing the screen? My kiddo busted our LCD panel and I ended up buying a new replacement screen off ebay for $45 (although some run $75-100). Justin @ Root of Good recently posted…Summer Plans – Travel The World? Ha, good thought! I will see what I can about the LCD, although I’m not sure the screen is the issue. It just doesn’t come on. Tried convincing the wife to get a Chromebook, she went the other way and got a Lenovo Yoga 2(I’m pretty sure you can excercise with it), since we haven’t bought one since about 2006. This was a battle I wasn’t going to win, but I have considered getting a chromebook because of the exact features you mentioned, but as luck would have it, my work gave me a laptop to use, so mine was “$Free$”. I use my computer for a ton of design work, so I need a non-chromebook, but I would consider getting one for my mom if she ever gets internet! iPad is a great tablet. I’m partial to the bigger one, but the Mini is a great device too. There is an article today that Google and VMware are teaming up to use VMware on the Chromebooks. This will allow people to access and use Windows Office. This will add to the productivity of the Chromebook. Yes, I read that too. Coincidentally, I’m a vSphere administrator as well and love the technology. Can’t wait to see what this partnership yields. I received an email today that HP is giving away 200mb of 4g service for a limited time. I am not in the market currently but when my laptop goes I am absolutely buying a chromebook. Very cool. I’ve considered the chromebook but the limited ability to work offline does concern me. But then again the fact that you can spend only $250-$350 for a computer amazes me. There is tons you can do offline! Be sure to research it before you write it off. I saw one for sale nearly brand new for £130 the other day… was very tempted! With the new Toshiba 13 and Chromebooks from Dell and others, expect to see the price drop on older Chromebooks, possibly seeing prices under $200 for a Chromebook with decent specs. Chromebook are really innovative way to intend a PC. But for me are most different than a classic PC, and for this for now it’s unthinkable.